A good understanding of place value (the value of each digit in a number) is vital in primary-school maths. Our parents' guide explains how your child will be taught about units, tens, hundreds and thousands with number lines, arrow cards and more, as well as outlining how place value is used to help children visualise calculations. Place value is the value of each digit in a number. It means understanding that 582 is made up of 500, 80 and 2, rather than 5, 8 and 2. How are children taught to understand place value in KS1? In school two maths aids are used to help make place value clear to children. In Key Stage 1, a child might be given some ten and units (ones) Deines blocks and asked to make a number such as 43. They would need to select 4 tens rods and 3 ones blocks. This makes it very clear to them that a two-digit number it made up of tens and ones. It also helps them to practise counting in tens. A child might be asked to make the number 34 using arrow cards. They would need to take the 30 and the 4 and put them together so that the arrows were lined up. 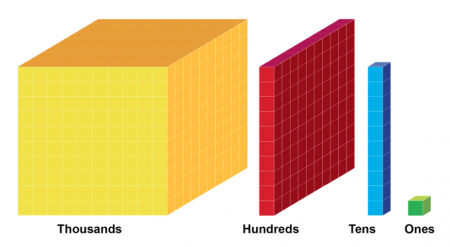 This again helps to make clear that a two-digit number is made up of tens and ones. It is absolutely vital that children understand place value before they can go onto adding and subtracting two-digit numbers. In Year 3, children might be given Deines blocks and arrow cards to help them with adding a pair of two-digit numbers. This would enable them to partition the numbers, so that they could add the tens first and then the units. A Year 3 child would also be expected to know the place value of digits in three-digit numbers. In Year 3, children also need to know what happens to a number when it is multiplied by 10 or 100. It is really important here that they are aware that the number moves to the left, rather than talking about 'adding zeros' (when children move onto dividing by 10 to find a decimal answer, they will not be able to use the strategy of adding or removing zeros). When multiplying 6 by ten, the number moves to the left and a zero is put in, so the number becomes 60. If you multiply 6 by 100, the number moves two places to the left and zeros are put in, so the number would become 600. In Year 4, children would need to use their knowledge of place value to work out sums and difference of pairs of multiples of 10, 100 or 1000. They might be asked to mentally work out 80 + 40 in which case they would need to 'cross 100' to find the answer 120. They might be asked to work out 700 + 600 or 8000 + 3000, in which case they would be crossing 1000 and 10,000. A number line can be helpful in these instances. 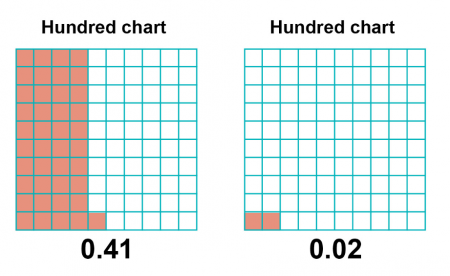 With the above two decimals, you can make it clear that 0.41 is 41/100 and 0.02 is 2/100. onto which children have to write a number that the teacher has said out loud. For example: the child might be asked to write the number 5.72. They might then be asked to add 0.1 to this number, at which point they would need to change the number to 5.82. They might be asked to subtract 0.01, at which point they would need to change the number to 5.81. When dividing 6 by ten, the number moves one place to the right and becomes 0.6. If you divide 6 by 100, the number moves two places to the right and becomes 0.06. In Year 6, children need to know their knowledge of place value to work out multiplication and division of decimals. For example, when working out 0.6 x 4, they would need to know that this is the same as working out 6 x 4 = 24, but then the answer needs to be divided by 10 (because 6 divided by 10 is 0.6) to make the answer 2.4.